Digital video stars on platforms like YouTube, Instagram and Snapchat are increasingly looking to expand beyond their home platforms and formats. Now, United Talent Agency and audio entertainment firm Cadence13 are launching a new venture to take advantage of that market. Ramble will distribute “Ear Biscuits” by the popular YouTube comedy duo Rhett and Link, “Curious with Josh Peck,” by the YouTube star and actor, “Hannahlyze” by Hannah Hart and “Boom Time” by Flula Borg, with other shows to be added later. For the creators, Ramble provides infrastructure such as equipment and producers to help create, share and distribute the podcasts, and will provide monetization capabilities. The company will also expand into events, merchandising and live tours with the stars. For marketers, the pitch is a simple one: it’s a podcast network where every show is hosted by someone with a massive online following, giving brands an “opportunity to form deeper connections by leveraging the relationships these creators already have with their fans.” Ramble has vetted the hosts and programs and helps to produce them, making it a one-stop shop for marketers looking to reach key young demos. As podcasts continue to grow in popularity, podcast networks are growing accordingly. While many direct-to-consumer brands (and increasingly major consumer brands) have been dipping their toes in the water, the networks are beginning to add scale to the equation, guaranteeing reach more closely related to digital video than traditional digital audio. 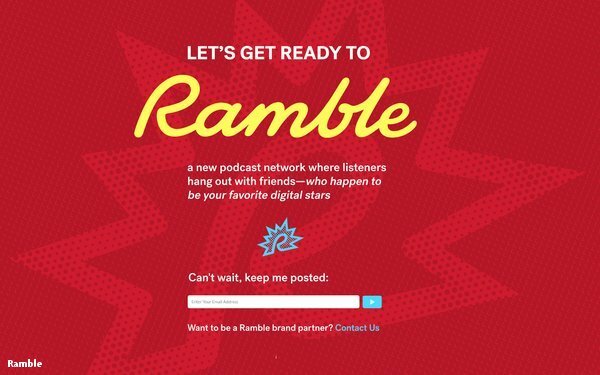 By forming a network based on established digital video stars, Ramble is betting it will have the scale and brand cache to succeed in an increasingly crowded marketplace.